The sad news that Stan Lee has died inevitably brings grief, but also a chance to look back on a career and life that has enriched so many of us. It’s not just the thousands of fans he had around the world, either. The likes of the Avengers: Infinity War directors, much of the MCU, and beyond have paid tribute to a man who has been described as a “genius”. While he’s more recently been known for his amazing movie cameos, the man who helped create Marvel Comics in the 1960s was, as many of the MCU stars’ tributes can attest, a powerful force for good behind the scenes, too. It’s the sign of a universally beloved figure that each tribute is wholly unique yet shares a common thread: Stan Lee lived his life well, and treated others with his generosity of spirit. 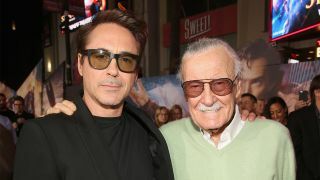 Kevin Feige and Joss Whedon, both hugely instrumental in shaping the MCU in their own way, have also shared the tremendous impact Stan Lee had on the pair of them. And it’s not just limited to comics. Spider-Man PS4 voice actor Yuri Lowenthal felt Stan himself summed up the situation best: Excelsior! On Instagram, too, tributes were left by some of the brightest Marvel stars, including Robert Downey Jr., Tom Holland, and Chris Pratt. I owe it all to you,,, Rest In Peace Stan... #MCU #Excelsior #legend #rip #stanlee #TeamStark Robert Downey Jr.
Leave it to Thanos himself, Josh Brolin, to pen one of the most loving, heartfelt tributes. Of course, Stan Lee’s reach wasn’t just tied to Marvel. Seth Rogen, Jamie Lee Curtis, and Mark Hamill can count themselves among the many, many millions forever influenced by the comic creator’s work and legacy. It may have been a small part of his legacy, but these Stan Lee cameos will never fail to make us laugh and smile. And that's what he wanted 'til the very end.